Large basket keeps cargo safe and out of the way. Handsome brushed aluminum styling looks great and its low profile helps keep wind noise to a minimum. 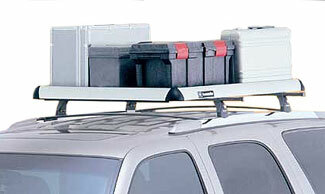 Easy on/ off hardware mounts directly to roof rack utility bars. Basket is 42inch x 52inch.